This porridge appeared on the plates of Russian royalty and Soviet workers. Pearl barley, or perlovka, is considered a pearl among the cereals because of its exceptional nutritional properties. This typical Russian recipe is an easy way to sample this healthy grain. 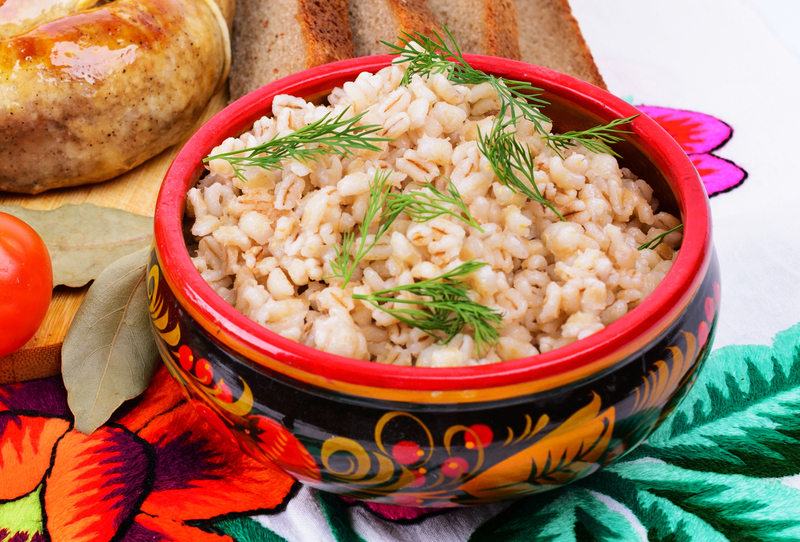 Pearl barley, known in Russian as perlovka, is a favorite of Russians from all walks of life. It appeared on the menu at the coronation banquet of Russian Emperor Nicholas II; Peter the Great loved it prepared with mushrooms, carrots and onions; and Prima Ballerina Maya Plisetskaya attributed her strength and beauty to it. Over time, the dish was transformed from the porridge of the tsar to the food guaranteed to be available in every cafeteria. During the Soviet era, perlovka was on the menu in kindergartens and factorie alike. It’s no wonder that pearl barley is so popular: it is an excellent source of fiber, which helps the body get rid of toxins. Consuming barley also helps decrease the risk of osteoporosis because it contains phosphorus and copper, necessary for bone and joint health. A portion of pearl barley also has nearly twice as much Vitamin C as an orange. Pearl barley is recommended for people with diabetes because its beta-glucan soluble fiber slows down glucose absorption. Introduce this healthy food into your diet with this traditional Russian recipe. 1. Wash the champignons and slice them thinly. 2. Peel and dice the onion, then saute it in a deep pan with a drop of oil. 3. Add the mushrooms and saute with the onion for about 10 minutes. 4. Rinse the pearl barley until the water runs clear. Add it to the mushrooms. Mix in the water or broth. 5. Bring to a boil, then reduce the heat. Simmer until ready, adding water if needed.